Tagged under CLAMP, BONES, Series. When Misaki Suzuhara was young, her mother left her with her grandparents, claiming she was leaving for business, but never returned. Now at 12 she goes to live with her aunt, knowing her mother lives in the same city. But after leaving the train station she see a big plasma TV showing two electronic dolls called angels fighting. Instantly falling in love with a white angel one. Then she meets a mysterious man called Icchan. He tells her all about these dolls and the game of Angelic Layer. She soon excels in the game and meeting new friends along the way. The idea of the Angelic Layer is very original as far as I know and the overall presentation of the anime was well rounded. The humor was lighthearted, as was the majority of the anime and it was a pleasure to watch. While not the most impressive series I've ever seen by any stretch, it is still well worth watching. 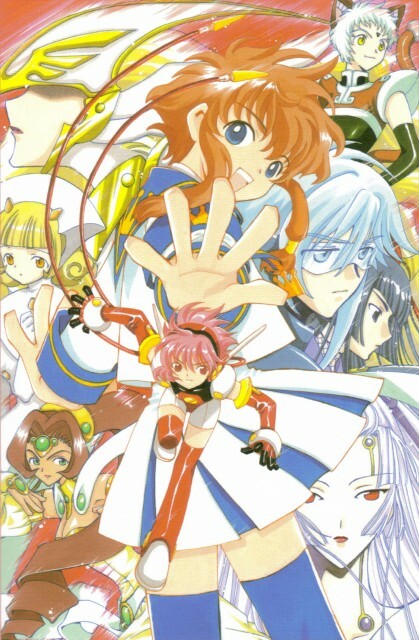 Angelic Layer, while it has a unique atmosphere for the action, i.e. on the Layer, is still not too unique as far as the progression of the series. There have been numerous anime that go through the "tournament" progression to reach the end of the series. The structure of the anime being so predictable, was one of the main things that subtracted from the appreciability of this series. I revisited this again in manga form a while ago and it really brought back memories. This quite a nice anime about dolls...and it's not just about the usual dolls (girly dolls to be precise haha). You can put it this way...the anime is like a mix of dolls and wrestling (or mixed martial arts). That's quite refreshing since you don't see something like that often. However, even if the show is on battling dolls, it still has its shoujo charm that would have girls enjoy the show. Another nice artwork from CLAMP. A lot of fighting scene between Hikaru and angels. an angel for themselves in this real world. Giving me a lot of inspiration on drawing anime girls. This is a real cute little anime I admit.Little Misaki Susuhara is transfered to Japan and notices a fight going on on the bigscreen,Two dolls<called Angels> having at each-other in a game called Angelic Layer.She decides to join in on the fun and an epic story unfolds of her trying to find her mother and at the same time winning the Angelic Layer.It's a very interesting anime and I would reccomend it to anyone with a taste for cute things. Very CLAMP :) I think it was nice to see a competition anime with GIRLS. Usually it's always the guys controlling the monsters or the cards or the disks or WHATEVER, but the main character in this one was a girl so I was happy about that. Figures CLAMP would take a common idea and take it a step further. Well, all in all it was a great series, though now that I'm older I doubt I could watch it again xD Just too childish. Anglic Layer is a ok anime and manga. It can become boring at times. The manga gets REALLY annoying when every time something scares the her in the least, the whole page blows up in this. "EEEEEEEKKKKKKKKKSSSSSSSSSSSS!" Trust me. its like naruto saying "believe it" when theres nothing 2 believe except probably 30 times within the manga. anyway, its about middle schoolers and this game called Angelic Layer that happens 2 turn dolls into fighting. sounds like pokemon to me. XD i say tht, becuz sometimes the pple who play anglic layer love there doll, or hate them. of course the dolls r called angels not dolls though they do nothing when there out of the battle or practice ring. well over all its good.